Reference inquiries from alumni during Reunions can lead to some pretty deep dives in our archival collections. This spring I had an opportunity to dig into a narrow but significant slice of early American history represented in the Amherst College archives – Shays’ Rebellion, a local conflict which began 231 years ago this summer. Shays’ Rebellion exemplifies the fierce reaction to the economic instability of rural America just after the American Revolution. As commerce grew after the end of the Revolutionary War, the informal system of exchange employed by farmers and merchants in Massachusetts was no longer viable. Merchants were in need of money in order to carry weight in foreign trade but farmers were unable to pay their debts. The Court of Common Pleas moved to allow creditors to call in debts. A belated but very happy Commencement to Amherst’s graduated seniors! We in the Archives are happy to have gotten to know so many of you through your coursework, personal research and thesis research. We wish you all the best out there! 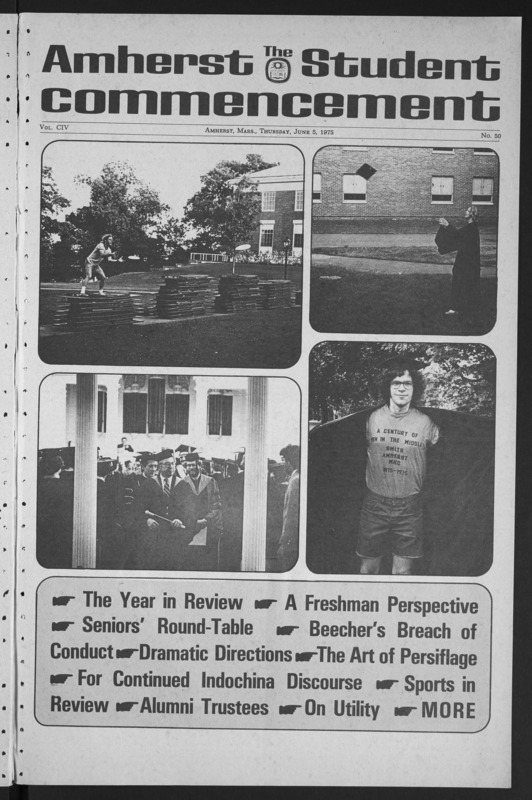 It has been a good long while since we wrote an update of what’s new in our Digital Collections and now the entire run of Amherst Student newspapers from 1959-1977 is entirely digitized and available in ACDC. Thanks to the hard work of our Digital Programs, Technical Services and IT departments, we are able to draw your attention to the Commencement issues of the Amherst Student from past decades. The art handlers just delivered this crate filled with Emily Dickinson manuscripts and books and ephemera. This crate is filled with several smaller boxes, all wrapped in plastic and safe in their particle board and Styrofoam chambers. After the years of work that went into mounting the Emily Dickinson exhibition at the Morgan Library in New York, it will take me just a couple of hours to unpack and restore each item to its Amherst home.